CLEVELAND — Corey Kluber's stellar first half ended with a sudden stop. Cleveland's ace received an injection in his right knee that will force him to miss the All-Star Game. But more importantly, the Indians are hoping it will allow the right-hander to continue leading their rotation after the break — and beyond. Kluber got the shot in his knee on Friday, a day after the two-time Cy Young Award winner gave up two runs in the eighth inning and was beaten by the New York Yankees. 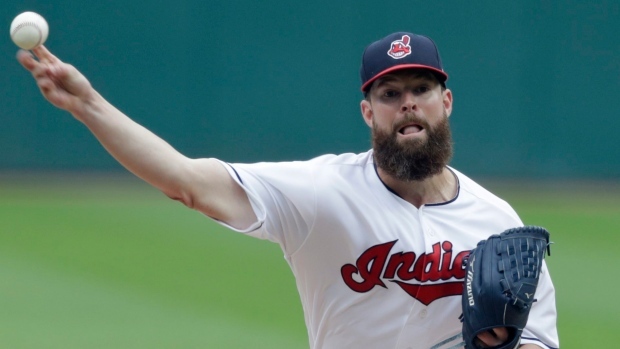 The AL Central-leading Indians said the right-hander will need at least one week to recover and he's not expected to make his next start until July 23 against Pittsburgh. Kluber has been replaced on the AL All-Star roster by Tampa Bay's Blake Snell. While Kluber's knee issue doesn't appear to be serious, the Indians aren't taking any chances. The 32-year-old pitcher took his fifth loss of the season Thursday night, but never mentioned any issues with his knee. Kluber has given up 19 runs over his last 34 innings, an uncharacteristic stretch for one of baseball's best. With the score tied, Kluber allowed a go-ahead double to New York's Aaron Hicks in the eighth inning and the Yankees went on to win 7-4, dropping Kluber to 12-5 this season. Kluber said the knee has been bothering him for a "few weeks." "I don't want to try to use it an excuse, but if anything it made it a little harder to consistently repeat my delivery the way that I want to," he said. "My arm action has been the same, but the release point's been lower." While the Indians hold a comfortable lead in the division, manager Terry Francona wants Kluber to be as close to 100 per cent as possible for the remainder of the season. "We've had this in the works for a while," Francona said. "We'll bring him back fourth coming out of the break so he can have a little bit of a break, because he's going to shoulder a huge load." "That's why we decided to do it now," Kluber said. "I would have liked to have pitched in the All-Star Game, but obviously the big picture, being healthy for the second half was more important." The Indians want to be careful with Kluber as the season progresses. He has logged a lot of innings during his career and the cumulative effect may have contributed to him being less than 100 per cent during last year's playoffs. It wasn't until after the Indians were beaten by the Yankees in the Division Series that Francona revealed Kluber was dealing with physical limitations during the series.